1. Wash the rice and put in a strainer. 2. 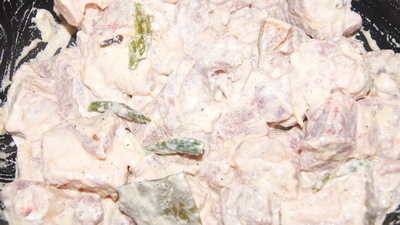 Marinate meat with all ingredients except onion and 8 clet it sits for at least 30 minutes. 3. Heat the heavy bottom sauce pan with oil and add onion. Fry onion till it becomes light golden. 4. Add meat and cook it till oil comes out. 5. Add 4 cups water and cook it till meat becomes tender and water dries up. 6. Remove meat from gravy and add 5 cups of water, sugar, salt and milk powder. 7. When it comes boiling point, add rice. 8. Cook the rice 10 minutes medium high heat under closed lid and add meat, chillies and clarified butter/ ghee. 9. Cook it on low heat about 15-20 minutes under closed lid and add kewra water. 10. Stir it and remove from heat. Tehri used to be my staple food while studying at DU back in 90’s. Still I did not know how to cook this. I will give this a try. What do you mean by Step 2? Cooking rice will take about 30 minutes …not 30 hours!!!!!!! 2. Marinate meat with all ingredients except onion and let it sits for at least 30 hour. Thanks.Definitely it will nt be hour. I fix that. hope it help now. May Allah bless your daughter . People often add too much salt in their recipes without realizing it until it’s too late, but do not worry. There is a way to fix this! Add two peeled and chopped raw potatoes to the dish, and then allow it to simmer for around 15 minutes. The potatoes help absorb the extra salt. For a dish that is tomato-based, just put a few more tomatoes in and let them cook until they’re tender. These will dilute the extra salt.,.. If we like to use oven to finish this dish, what would be the process? I am guessing after step 8 we will have to put the rice on oven. Any info on timing and temperature would be appreciated. Sorry for late reply. Preheat oven 150˚C or 300˚F and bake for 1 hour. Thanks. Depend on rice(vary rice to rice)1 cup rice about 200 grams. I will prefer this recipe with 600-700 grams rice. Thanks. Thank you so much for sharing such wonderful recipes. I have just started making them and am loving them already. 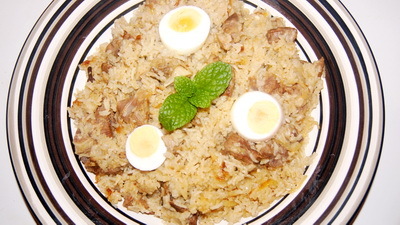 It is my first time cooking this so I wanted to know what is better to use, basmati rice or kalijeera rice? Doesn’t the amount of water depend on what kind of rice we use?